Being among the first to voluntarily desegregate the public schools in Oklahoma City prepared Paula Pretlow to do many things. It prepared her to compete with white classmates from more affluent backgrounds at Northwestern in the 1970s. It prepared her for great success in the business world. But it did not quite prepare her for the moment earlier this year when a young black man she was mentoring broke down in tears. “This young man is from a single parent household, and for the first time, he is talking about — and writing about — his father, who is in prison. That’s what he’s writing his college essay on,” says Pretlow, a former SVP from The Capital Group who, in addition to serving on a number of high-profile boards, is a writing coach for a local college-readiness program. “The first time we met, he broke down and cried. And I just held this young man in my arms,” Pretlow says. Pretlow earned her B.A. in political science from Weinberg College in 1977 and her M.B.A. from the Kellogg School of Management in 1978, and spent the next 35 years working her way to the top of the investment management world. Throughout those years, Pretlow focused on education as an area to give back. She continues to this day, bringing her own personal narrative full circle — focusing time and fundraising dollars on education projects that give under-represented minority students the support and opportunities to succeed that she received nearly 50 years ago. That mission is keeping Pretlow busier than ever. In addition to volunteering for youth-serving organizations such as the Achieve Foundation and SEO Scholars, Pretlow is active on Weinberg College’s Board of Visitors. 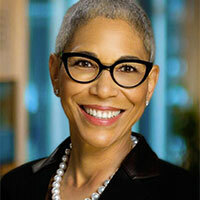 She is also on the presidential search committee at Pitzer College, where she serves on the board of trustees. In addition, she was elected to the board of the Kresge Foundation earlier this year and is a member of the Education Program working group. “It’s important to take a step back and reflect on what makes a person become who and what they are,” Pretlow says. “In addition to my strong family background with an emphasis on education, Northwestern helped prepare me for the success I have enjoyed in my life and my career.